The UK MoD has today announced four shipbuilding firms and a British consortium have been selected to compete for the RFA Fleet Solid Support ships contract. News Release, 30 November 2018: A syndicate of British firms, along with four international shipbuilding companies, have been selected to compete for the Fleet Solid Support ships contract, Defence Minister Stuart Andrew has announced. The crucial vessels, which will deliver ammunition, food and supplies to UK forces across the globe, will work alongside the Royal Navy’s fleet of warships and will be an important part of the UK Maritime Task Group. The British consortium is made up of leading manufacturing and engineering companies Babcock, BAE Systems, Cammell Laird and Rolls-Royce. They join Italian firm Fincantieri, Spanish company Navantia, Japan Marine United Corporation, and Daewoo Shipbuilding and Marine Engineering of South Korea as the five successful firms who have been invited to submit a tender for the competition. The Fleet Solid Support ships, up to three of which will be procured through international competition as they are not warships, will be fitted with specialist and classified equipment at a British shipyard before entering service with the Royal Fleet Auxiliary from 2026. Shipyards across the United Kingdom will be able to bid for this work in 2022. 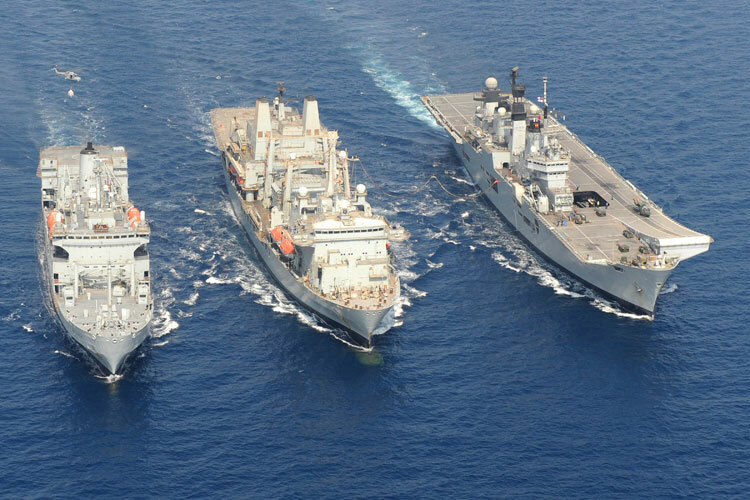 Footnote: The two current Fleet Solid Support Ships operated by the RFA are Fort Austin and Fort Rosalie. The third Fort-class ship, RFA Fort Victoria, is larger and an oiler rather than a stores ship.